A "job fair" is an event in which many employers gather in one location to advertise job openings, publicize their companies, and meet prospective job candidates. Job fairs can be sponsored by colleges, cities, professional organizations, or employers. Job fairs offer you the opportunity to meet representatives from organizations in person. Meeting people face-to-face who have influence in the hiring process is proven to be much more effective than responding to job openings by submitting resumes. Here is a great resource for finding job fairs in your area. You can also find many other job fairs by googling "job fairs" in your city and/or state. 1. Wear "interview attire." That is, dress as if you are going to an interview. Consider yourself to be in an interview any time you are face-to-face with a person who has the power to hire you (or who can connect you with those who have the power to hire you). You want to make a good first impression, and show that you are taking the event seriously. 2. Research ahead of time the companies who will be present at the job fair. Typically, the organizer of the job fair will have a list of participating companies on its website. Take time to gather key information ahead of time by researching organizations' websites. You can learn about a company's products/services, its mission and values, corporate goals, available openings, etc. Your research will prepare you to talk intelligently with the company representative and ask pertinent questions. You will stand out from those who approach a table and ask, "So what does XYZ Company do?" If you are unable to research the company prior to the fair, pick up information at their table and go elsewhere to read through it prior to approaching the company representatives. 3. Plan your strategy for working the fair. Prioritize the companies that will be at the fair according to your interest in working for them. Write down any questions you have for each of these companies, and your goals in talking with them. (Sample goals: To find out if they have a call center or utilize customer service reps / To find out the name of the head of the information systems department / To find out what type of accounting software they use, the size of their accounting department, and the name of the department manager / To find out if they have current openings for a __________, and how often openings for that type of position occur.) When you arrive at the fair, see if any new companies have registered, and note any of interest to you. Note: At a job fair, we suggest that you not begin with the company of highest interest to you. Go first to a company of lower or little interest and practice your approach on them! You'll then be "warmed up" when you approach companies of highest interest. 5. Bring several resumes with you (at least two for each company of interest). If you have more than one job objective, bring sufficient quantities of each version of your resume. A portfolio can also include documents such as reports you have written, output of a software program you wrote, certificates of recognition or completion of a training program, a list of educational courses you have completed, letters of commendation, etc. The recruiter or company representative may not have time to look at your portfolio during the job fair, but if he or she does, it will help you to stand out from other applicants. 7. Make a good first impression. Remember to dress appropriately and be well groomed! 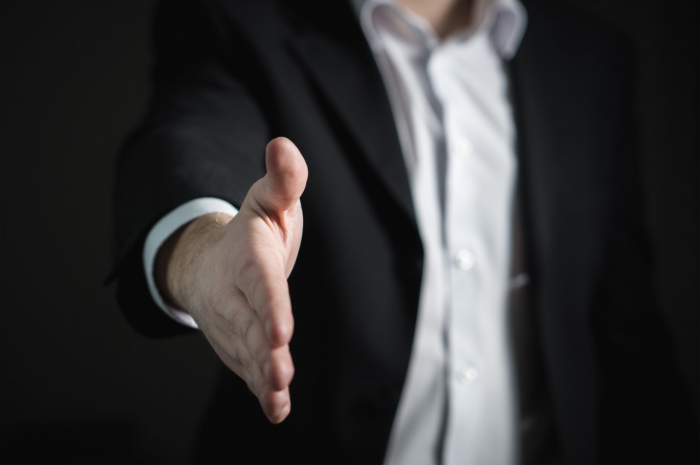 When meeting the company representative, make good eye contact, smile and extend your hand to shake while introducing yourself. 8. Prepare for your "mini-interview" with the company representative. Before the job fair, think through what questions you would like to ask. For example, you could ask a question such as, "What qualifications do you look for in a (job title)?" 9. Answer questions as concisely and courteously as possible. Listen carefully to what the recruiter is asking. Give no more than a 30-60 second answer. The recruiter can always ask you additional questions if he or she wants to hear more! 10. Seek to get a second (in-house) interview. You can ask the recruiter for an appraisal of your qualifications: "How do I compare with the other candidates you are seeing?" If you receive favorable feedback, and if you are interested in working for the company, let the recruiter know: "I am very interested in this position, and I believe I could do the job well. What do I need to do to arrange a second interview?" If the second interview has been arranged, thank the recruiter for his time, express your enthusiasm for the company and position, and your appreciation for the opportunity to be considered further. If you are waiting to hear about a second interview, thank the recruiter for her time, remind her of your interest and qualifications, and request again the opportunity for a second interview. State that you will follow up the letter with phone call (and then make sure you do it!). Enclose another copy of your resume. Take advantage of career testing, and professional career counseling and job search assistance to understand your God-given design and find work that uses your best skills and abilities.